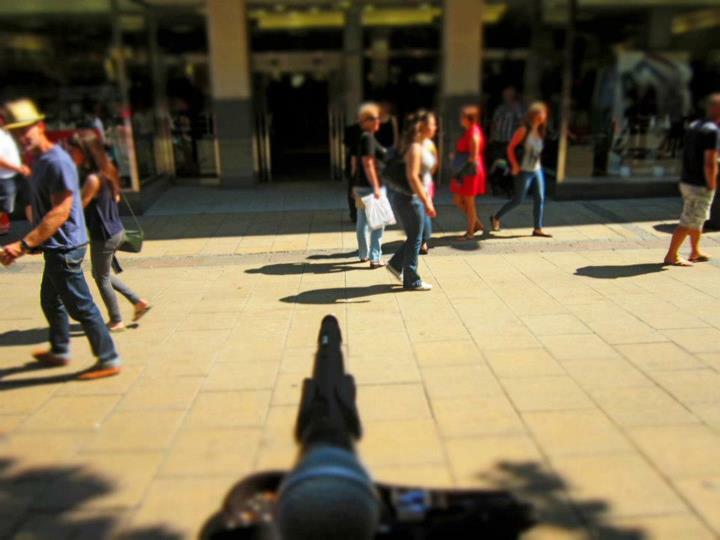 A Busker’s Life. 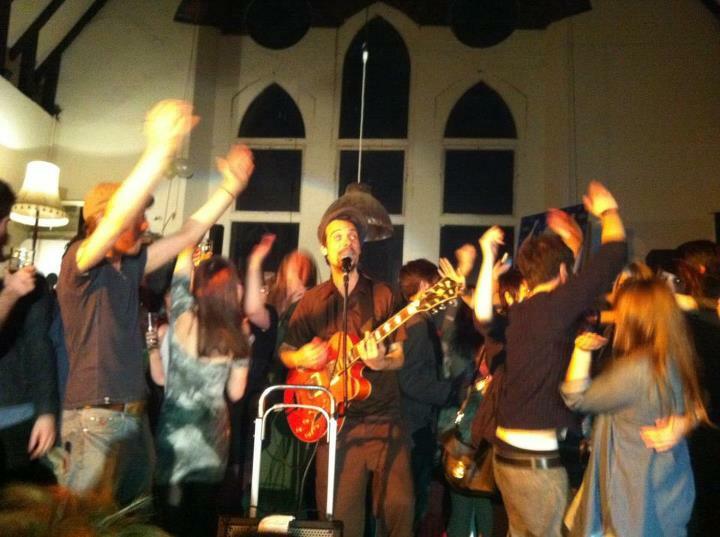 | THESE SHOES ARE MADE FOR BUSKING ! If the mountain doesn’t go to Mohamed.. But returning to a freezing Europe this same man found himself fired from his job, evicted from his flat, Vespa-less (confiscated by the Italian police for having no apparent insurance!) and without much left in his bank … It was then that he started to call himself the Miserable Man! He needed a change… so he left for Norwich, in the UK on the advice of his friend Mani: Norwich was busker friendly and he was sure to like it…!? And sure enough, he felt immediately at home there. 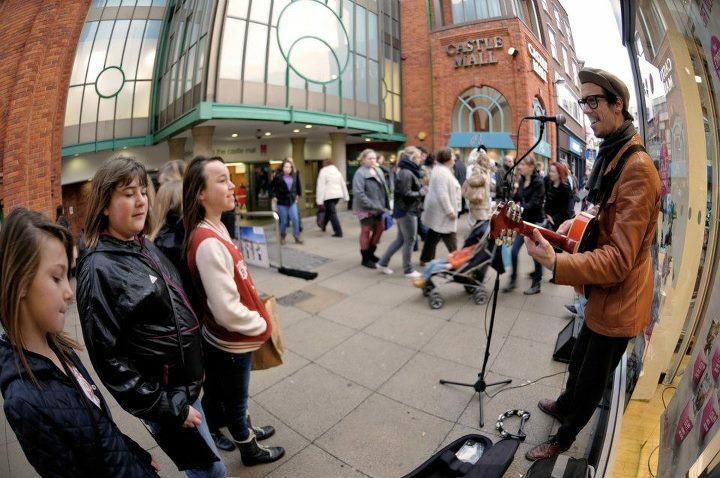 He started busking every day in the city despite the below zero winter temperatures and his reverb pedal battery getting frozen…But at least he saw that there was no need to look for a job, because the perfect job had found him! 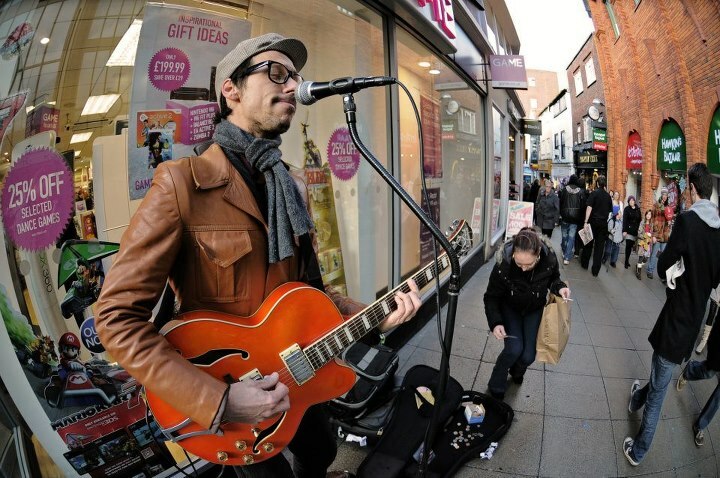 MM jammin’ in the streets of Norwich. It had never been his intention to play covers but one day he went to the streets with a ‘reggaed’ version of the famous Coldplay hit “Fix You” and saw that it was working and, more than that, it was fun to play in this new light, so he started to re arrange more pop tunes to please the punters, as well as continuing to compose his original songs…In those cold months, many hits were Miserablized, including songs from The Smiths, Tracy Chapman, Pink Floyd, Bruce Springsteen, George Michael and Elton John – the heroes of his childhood – plus more recent songs from the likes of Radiohead, Travis and Snow Patrol. The spring arrived, and he moved on from Norwich and travelled all around the south of England. He was finally able to do two of his favourite things together: travelling and playing music…! An happy crowd takes over the stage.. So, what can we expect from a Miserable Man? His task is to play uplifting music that will bring to mind classic tunes with the energizing twist of Jamaican ska and rocksteady. He loves to play in the morning, for the crowds going to work, and he likes to think of music in a quantic way: music is vibrations, and humans are vibrating atoms too…! 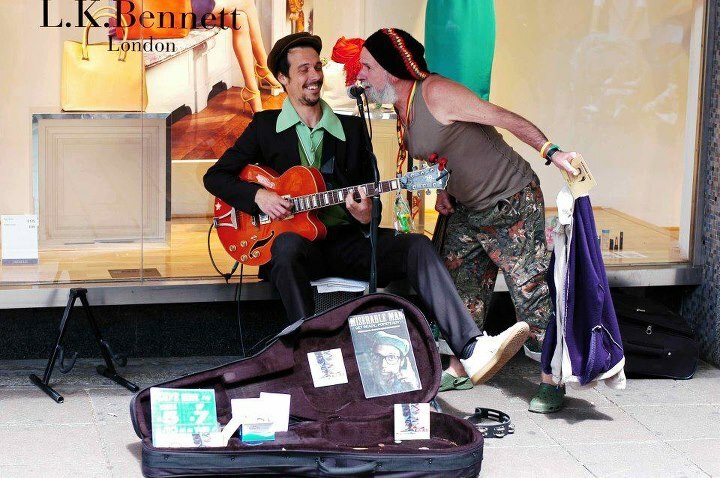 The daily busking lifestyle gives Miserable Man all the proof he needs that people everywhere love music and respond to this kind of vibration exchange…Miserable Man is happy to think that he does one of the oldest jobs in the world: a minstrel, the vibe provider. He loves to see how the right song at the right moment can just stop people during their daily race; make children dance so crazily that the surprised parent can’t help taking snaps and videos of them; make old people feel young, and make disabled people smile and move to the rhythm of the music. MM and the Rastaman from Thetford, helping out with some backing vocals. 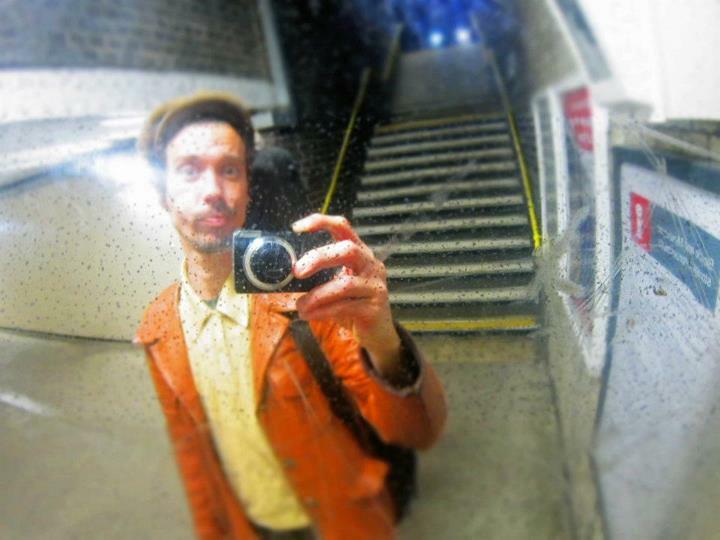 Miserable man is here to cheer you up, with his pop steady soulful music. He tries to be a free musician in a not so free world; he tries to deliver a simple and clear message; he’s trying to be the change he wants to see in the world. May your life be your example. Ahoy there MM . . .
You got it right dude . . . Living the way you want to live . . . Spreading goodvibes through your art . . . And inspiring others by your archive of written words & images . . . I kind of do what what you kind of do . . . Blessed to enjoy the busking travelling surfing & sailing life . . . My life is my job & my job is my life . . . All power to you bro . . .
Hope to meet you on the street sometime ! Yo Captain Tricko! Thanks for following the blog! Hugs!